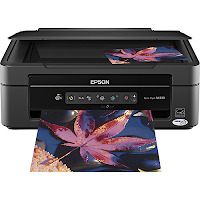 As part of Best Buy's 5 Days of Deals Sale they are now offering this Epson Stylus Small-in-One Wireless All-In-One Printer for just $40, and includes FREE shipping (reg. $70). I was just watching a movie from the early nineties and they had a dot-matrix printer in it. Remember those? Where you had to line the paper in the holes and it went back and forth making that SCREEE SCREEE SCREEE sound? Ah, memories. What's the point of that trip down memory lane? Because printer tech has evolved leaps and bounds. This tiny device prints, copies and scans. It's wireless, which means you can do what I do with mine and leave it in the garage so it's out of site. I mean, what more can you ask for from a name-brand printer that's only $40 and is delivered to your door? Click here to view this and other deals during Best Buy's 5 Days for Dad sale.